Looking for a great and affordable getaway in North Carolina? Look no further, this is it! 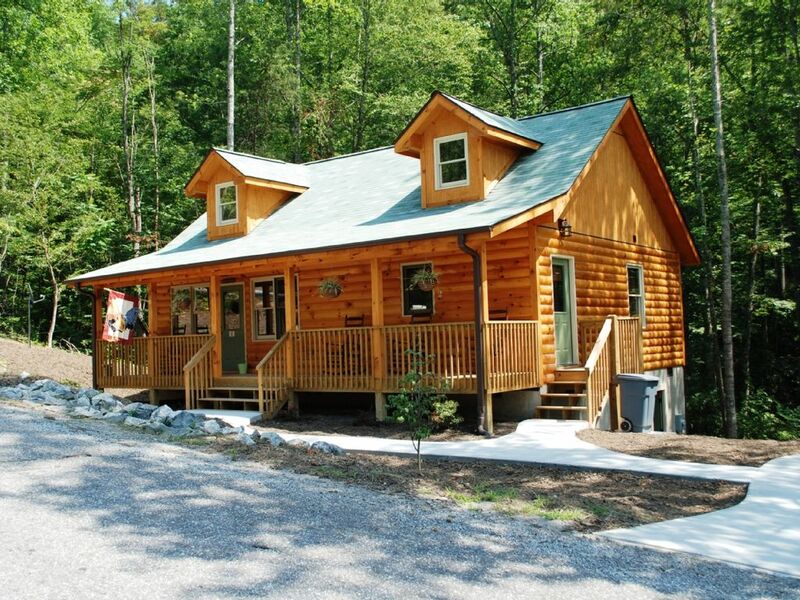 The cabin at 'Rooster Ridge' is a brand new two bedroom, two bath retreat, located mid-way between Hendersonville and Lake Lure NC. Convenient to downtown, Chimney Rock, Lake Lure and Asheville this is the best of both worlds. A private deck off the master bedroom, features a relaxing hot tub spa for your enjoyment. The rustic fireplace and comfortable living area are perfect for movie nights in front of the 42'' flat screen tv. The Cabin at'Rooster Ridge' is cozy, clean and waiting for you. Please visit our web site at www.classiccarolinacabins.com. 6. Cancellations – A thirty (30) day notice is required for cancellation. Cancellations or changes that result in a shortened stay, that are made within 30 days of the arrival date will receive all monies returned. Within 30 days are subject to forfeit the full advance payment and damage/reservation deposit. Cancellation or early departure does not warrant any refund of rent or deposit. I highly suggest trip insurance. 7.	http://www.insuremytrip.com/index.html?linkId=FN283002 12. Storm Policy - No refunds will be given for roads that are curvy and steep. Gravel drives are well maintained, however we recommend four wheel drive and or chains during the snow months as this is a mountain property. No monies are returned by owner. I highly suggest travel insurance. Great girls weekend get away. I would give this place a 5 start rating but there are a few things that deter me. First, the parking was a little treacherous and it gave me anxiety parking on the narrow cemented roundabout. Second, the second night we stayed my body got chewed up by some kind of insect. It was enough so that I did not sleep at all that night and the night after I slept on the couch. We really enjoyed the jacuzzi! Beside that the place was warm, welcoming, clean and a great place to relax and enjoy time with friends. If you are planning on going in the winter time, when there is snow, be prepared for a steep upward drive to the property. Overall a really nice place. Pretty much all you need for a stay. Close to a lot of things to do and see,Chimney Rock and Lake Lure are really close. There was no cooking grate in the grill, bummer! What can I say I'm a grill guy! Fire pit in sorta weird spot,but all in all a nice place convenient location and reasonable rates. The cabin was beautiful and homey. The photo makes it appear that it’s sitting in a clearing but it’s not. It’s next to the road and woods are right up next to the back. But I still loved it and had a great visit. The cottage was super comfortable, very clean and well furnished. The only suggestion I have to the owner is to add internet to the cable package. It is hard for most professionals to function today (even when on vacation) without limitless internet. We managed as nearby towns have several Cafe's with great WIFI. But all in all definitely a lovely place to stay! This cabin is located in a great location. We were able to explore several places in NC because of the location of this cabin. The cabin itself was nice, clean and equipped with every necessity. We made breakfast every morning and dinner almost every night and had all the right kitchenware. Having the fireplace and hot tub made our stay even more special. Our son couldn’t get out of the hot tub! For winter stays, you best have 4 wheel drive or all wheel drive. The road up is steep and ices over easily. And the driveway itself is small. But our truck fit and drove fine. No complaints! $150.00 reservation/damage deposit required Cleaning fee of $75.00 for the first (4) people and $25.00 each additional person. $40.00 dog fee per dog.